Thang Long specializes in making awesome quality Vietnamese Coffee Filters. 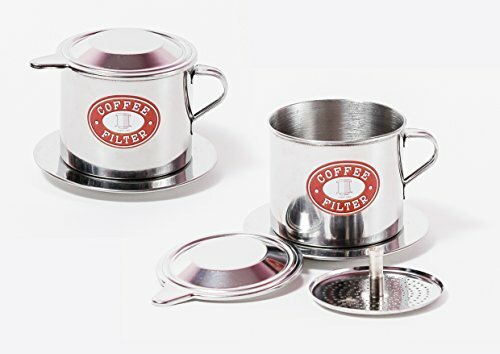 They are authentic filters made from high quality stainless steel in Vietnam (not China). All of our filters come with a LIFETIME WARRANTY. We are so confident that you will love this Vietnamese Coffee Filter that we offer a 90 DAY MONEY BACK GUARANTEE, no questions asked! This is a screw down insert. If you prefer a gravity insert simply click on the "Thang Long" brand or search for B01953YT1I. This filter comes in 3 sizes- Small (6 oz), Medium (8 oz), and Large (11 oz) and can be purchased in multi packs for extra savings. Comes with easy to follow PICTORIAL INSTRUCTIONS. Vietnamese Robusta Coffee is unlike any other types of coffee. It has a bold, brash, rich flavour which can be offset with sweet condensed milk. The high caffeine content in Robusta beans will get you ready to start the day with a bang! To start your day making your own AMAZING Caphe Sua Da (Vietnamese iced Coffee) from home, click the "Add to Cart" button above and to the right. SET OF 2 Screw Down Vietnamese Coffee filters with a LIFETIME WARRANTY. Awesome way to brew coffee. Inexpensive, portable, reusable, and environmentally friendly filter. Use Traditional Vietnamese Robusta Coffee or grind coffee beans of choice. INSTRUCTIONS included. Made in VIETNAM (not China) with QUALITY stainless steel. SCREW DOWN INSERT. Easy to clean. To start making your own DELICOUS Vietnamese Iced Coffee at home click the "add to cart" button. If you have any questions about this product by Thang Long, contact us by completing and submitting the form below. If you are looking for a specif part number, please include it with your message. Reusable Stainless Steel Coffee Filter – AINOK Stainless Steel Pour Over Coffee Dripper with Double Layered Filter,Reusable Coffee Filter with Removable Cup Stand，Brush and spoon.